Glastonbury is finally here (well, maybe in a few more days, but who says I can’t already be in festival mode now?)! The Glastonbury Festival (which takes place in England from June 27-29th) has just announced their lineup for this year’s party. The lineup is incredible: I mean they literally have something for everyone – headlined by Arcade Fire with other artists like The 1975, James Blake, Ed Sheeran, Chance the Rapper, Disclosure, Parquet Courts, Jack White, CHVRCHES, The Black Keys, Lily Allen, Foster the People, the Pixies, M.I.A., MGMT, tUnE-yArDs, Warpaint, Jagwar Ma…even Dolly Parton. 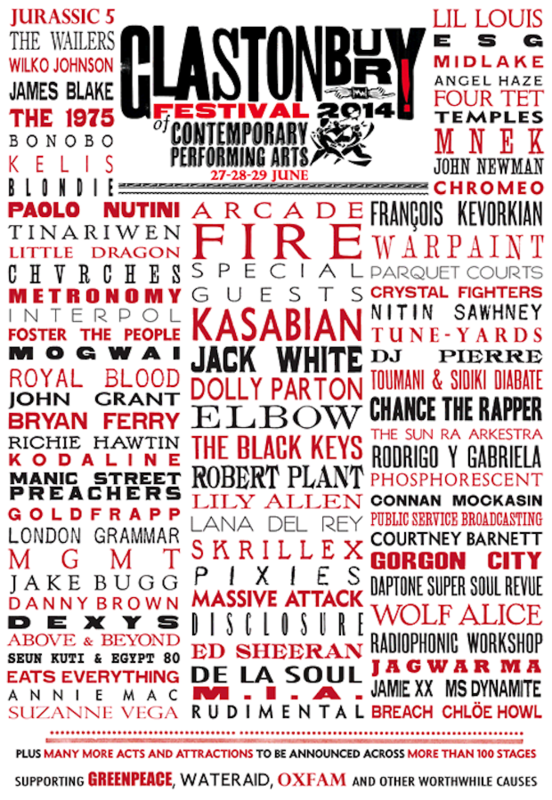 And that’s not even close to everyone; more acts will be announced across more than 100 stages. This is easily one of the biggest festivals of the year, and so you can probably already guess that tickets are sold out. Let me go cry in a corner real quick. But do not fret! Lucky enough for those who have previously registered for the festival but didn’t grab a ticket, a resale for those who haven’t paid their tickets off will take place on April 24th. Looks like I won’t be attending this year, but hey, there will be some hella good YouTube videos of all these great performances that I’ll get to watch, I’m sure (and we all know how I like to do that). Go check out their website for some more information if you fancy. Cheerio.